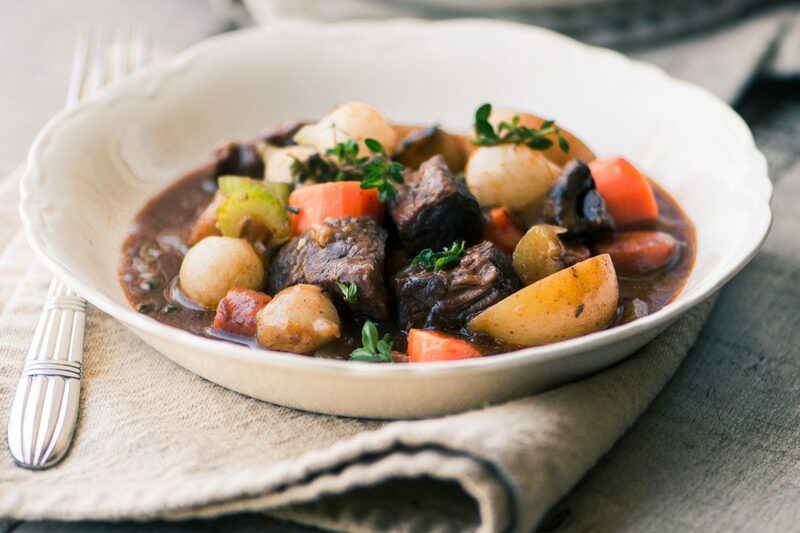 The Best Instant Pot Beef Bourguignon ~ this epic beef stew cooks in just 30 minutes in the amazing Instant Pot. The meat is melt in your mouth tender and the famous French flavors shine through ~ don’t miss this one! *This post is sponsored by the Certified Angus Beef® brand in conjunction with a social media campaign through Sunday Supper LLC. All opinions are my own. It gives me such pleasure to team up a brand that I feel so passionately about, thanks for supporting both of us! Certified Angus Beef® brand beef is the best beef you can buy. The Instant Pot leaves every other cooking method in the dust. 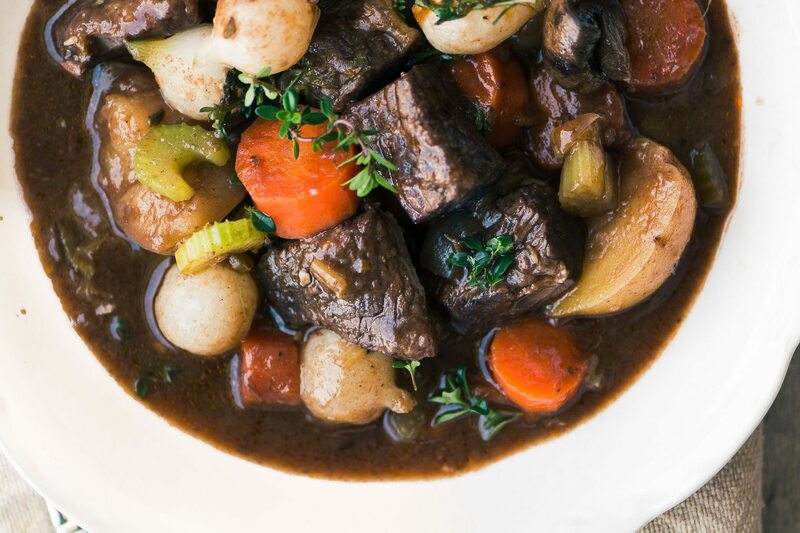 Beef Bourguignon is beef stew kicked up a whole lot of notches. Put them all together and you get one epic meal! If you caught my MIDDLE EASTERN NACHOS post already know how I feel about Certified Angus Beef® brand, and if you caught my 30 MINUTE INSTANT POT LOBSTER RISOTTO you know how I feel about the Instant Pot. Put the two together and things are bound to get exciting. 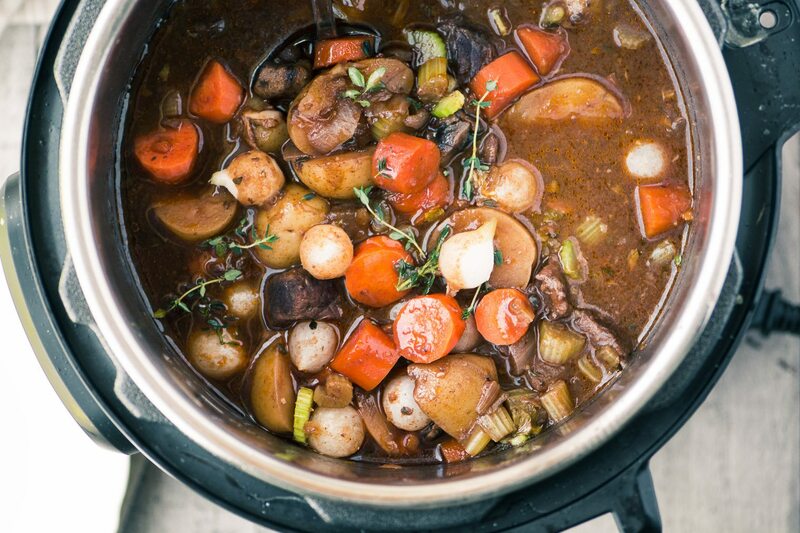 This beef bourguignon literally cooks in 30 minutes. And the meat is fork tender. In fact, you have to be extra careful with your fork, the meat has a tendency to fall apart even before it gets to your mouth. Of course there’s a little prep work to be done ahead of pressing that 30 minute timer on your Instant Pot. You’ll need to chop your veggies and cut your meat into chunks. You’ll want carrots, onion, celery, and potatoes. If you’ve got mushrooms hanging around, throw them in, too. This part can be done ahead of time, though, so no worries. When you choose your meat, look for a nice bright color, and lots of marbling. Marbling is the veining of at that goes through the meat. As it cooks, that marbling translates to flavor and tenderness. I chose a nice big boneless top sirloin steak for my stew and I was thrilled with the results, but there are lots of other ways to go, just make sure it’s got the Certified Angus Beef® brand label. There’s a handy guide on their website that helps you choose the right cut for your recipe. I dredge the meat in flour, salt and pepper, and then brown it right in the pot. I do this in two stages because if you overcrowd the pan with meat it won’t brown. 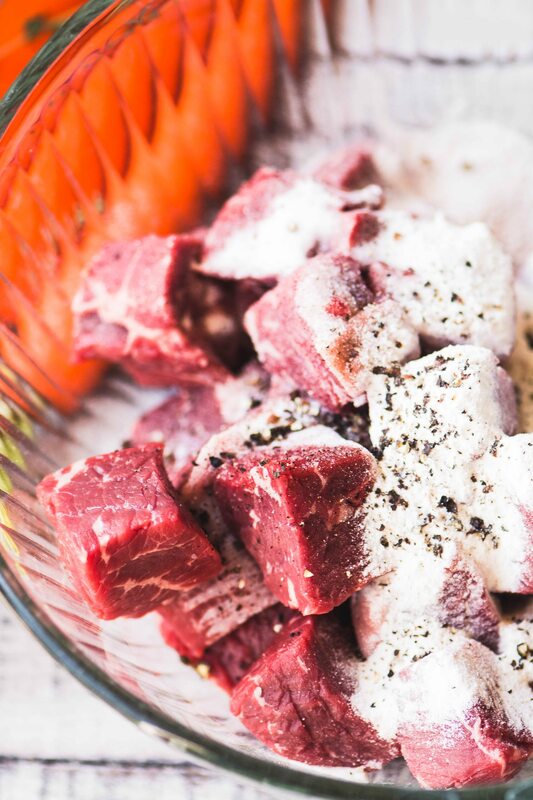 That browning is what contributes to the flavor of the Bourguignon later on, so take the time to get good color on your beef at this stage. Once the meat is browned, I’ll deglaze the pan with a splash of cognac (the secret ingredient in bourguignon.) Then everything goes in the pot, along with the red wine, beef stock, and flavorings. Does alcohol cook off in the Instant Pot? 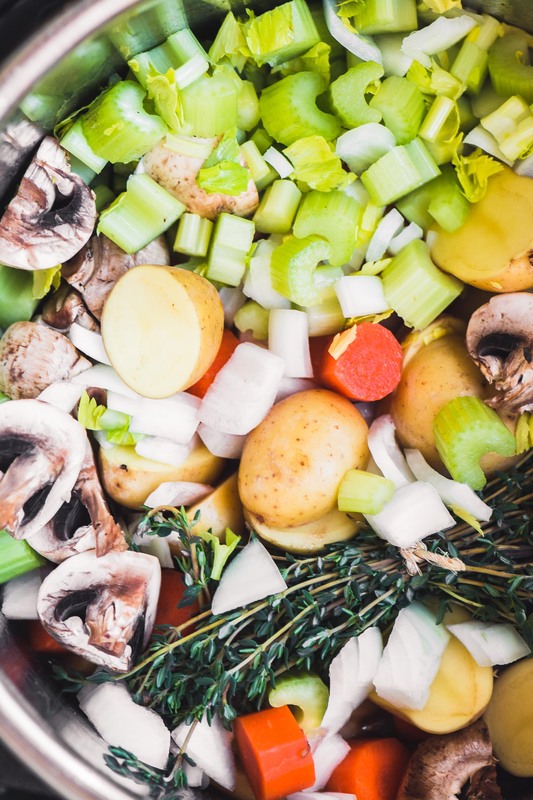 The alcohol that you use in an Instant Pot, pressure cooker, or slow cooker won’t cook off in the same way that it does on the stove top, since it’s sealed in and can’t evaporate into steam. A portion of the alcohol will be released in a concentrated form when you open the pressure release valve at the end of the cooking. Beef Bourguignon and other dishes like my ROSÉ RISOTTO that feature larger amounts of wine or alcohol should be reserved for adults. Once everything is in the pot you can close and lock the lid. Now the magic happens. Set the controls to ‘Pressure Cook’ for 30 minutes. I add the pearl onions in at the end, and stir in a slurry of flour and water to thicken the gravy. Now it’s ready to ladle into shallow bowls and serve with the rest of that wine. Toss the beef with the flour, salt and pepper. Make sure all the meat is coated with the flour. Heat the olive oil in your Instant Pot, set to Sauté. When the screen reads 'Hot', add 1/2 the meat to the pot to brown. Let the meat get good color on all sides, (4-5 minutes) then remove and brown the remaining meat. Add all the meat back into the pot and add the cognac. Stir to combine and let the cognac bubble for a minute. I like to scrape up any browned bits from the bottom of the pot. Press 'Cancel' and then add the bundle of thyme, the onions, celery, potatoes, carrots, mushrooms, and garlic. Whisk together the wine, broth, tomato paste, Worcestershire sauce, and gravy browning, and pour into the pot. Give everything a stir, then close and lock the lid. Put the vent to the seal position, and press 'Pressure Cook'. Set the timer to 30 minutes. When the machine beeps, press cancel and let it sit for 15 minutes. Then set the pressure valve to release, and wait for the pressure to come down. Open the lid and remove the thyme bundle. I like to set the Instant Pot to sauté at this point and add the onions and flour slurry. Stir well as the stew thickens. Be sure to taste to adjust the salt and pepper, you will likely need more. You can also add more Worcestershire sauce at this point if you feel it needs it. 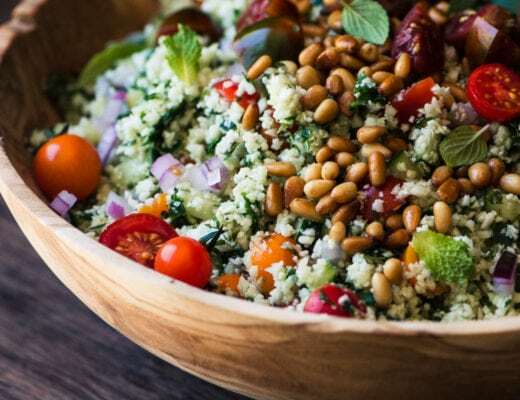 Serve in shallow bowls with a sprinkle of fresh thyme. Be sure to cut your carrots and potatoes on the large size, they do get soft in the IP. Alternatively, you could cook everything except the potatoes and carrots for 2o minutes, then cancel, let the pressure reduce, add them, and pressure cook for an additional 10 minutes. This would result in a firmer texture for the vegetables. Thanks for pinning this Instant Pot Beef Bourguignon! That came out really great! I didn’t have the little onions which would have been a nice addition. Thanks Darlene ~ I noticed that Trader Joe’s has nice packages of the small pearl onions in the frozen section. My college age son could eat a couple pounds of beef in a sitting. Can I double this recipe? The instapot my sister gave me for Christmas is either 6 or 8 quarts – either way, I’m hoping it will be big enough? If you say under the max fill line you should be ok. When you double recipes for the Instant Pot you don’t always need to double the liquids because there is no evaporation. It will take a little trial and error to get the right amounts. Do you think this would be just as good if prepared a day ahead and rewarmed in a dutch oven? I think that should be ok Bev. I noticed that you do not call for bacon. Curious. Thanks! Hi, I don’t have any cognac but I do have whiskey and rum. Would either of these work as a suitable substitute? Or will it turn out okay to leave out the cognac? It’s ok to leave it out Lauren, but you could add the whiskey if you like. This receipt sounds wonderful and I just got an Instant pot so planning to make this. On a personal note, I would never, ever use anything beef unless it is “Grass-fed”. Yes, I know, it’s a bit more expensive. But what are the medical expenses compared to non GMO grass fed beef? Does anyone really want to eat beef from a cow who has been injected with hormones rather than eating how they are supposed to which is natural. I am not a big meat eater, but when I do have any, I go grass fed all the way. Thanks for the great point, Debra. I think it’s super important to be mindful of where all our food comes from, but most important when it comes to animals. 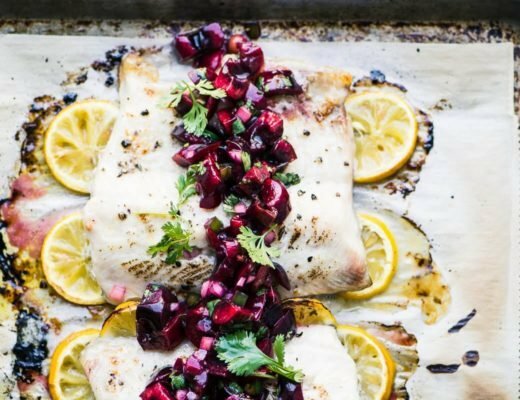 I wanted to thank you for posting this recipe. I made this tonight; the first time I have used my new insta pot! It was just amazing. My husband was very impressed. There were a few things I had to leave out as we are visiting at our cousins cabin and so I used and improvised with what I had on hand but I can only imagine if I’d had the several items that were missing how much more amazing it would have been!!! I’ll be making this again tomorrow as I still had so much meat left to sauté up! I believe Julia would be quite impressed with your recipes. Thank you again and I’d definitely give this 5 stars!!! I’m so glad this worked out for you, and don’t you LOVE that instant pot?? I’m looking forward to using it “ALOT” time saving and yummy food. Thank you! I’m not sure I understand your question Lili. There’s a slurry of flour and water that thickens this stew, that’s 4 Tbsp of flour mixed with 4 Tbsp of water. That gets stirred in at the end, to thicken the sauce. The frozen onions also go in at the end. Hope this clarifies! What is “gravy browning”? Is it a product ? Does it refer to a step in the cooking? Please clarify. Hey Jane, yes, gravy browning is a liquid that is added to gravies and sauces to give them a color boost, basically. Sometimes even when they taste fine, gravies can look a little grey, so this product helps with the eye appeal. Look for it with the gravy mixes, etc, in your supermarket, the most common brand here is Kitchen Bouquet, but there are many others. It usually comes in a small bottle. There is another gravy browning, in powdered form. It is called Bisto and is originally from the UK but is available in Canada. So you say to let it release steam for 15 minutes after. Does that mean letting it naturally release for 15 minutes, then manually releasing the rest, or just letting it naturally release till it’s clear? I just tried to clarify that in the recipe, thanks Justin ~ you wait 15 minutes, THEN release the pressure valve. Awesome! The best dish i have made so far. I will admit i was a little nervous about how many ingredients, your directions were spot on perfect. Was still the best recipie ever! Thanks Deanna, I’m especially glad to hear my directions were good, that’s the key to a recipe’s success! Made the best recipie ever. I did mistake the black pepper, added too much. Got freaked out by numerous ingrediets. Pulled through, it was Awesome! Going to follow EXACT directions next time. I used the Cuisinart pressure cooker and the dish turned out beautifully. It was a little soupy for my taste so next time I will probably reduce the broth and red wine to 3/4 cup each. The slurry worked fine when I turned off the cooker and started it back on simmer. The meat was tender and the large cut veggies kept their shape and texture. I am now going to use brandy for all my pan de-glazing; it adds color and richness and a wonderful aroma. 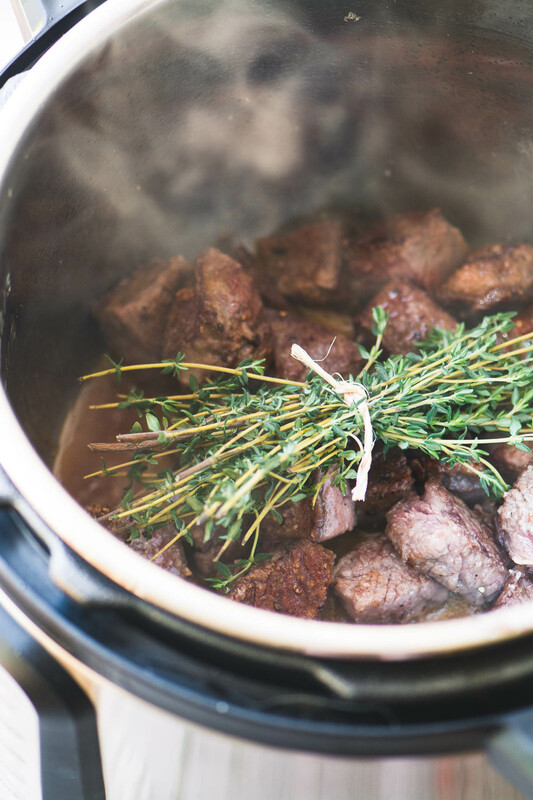 My slow cooker stews always tasted flat even when I browned the meat in advance and my dear Dutch oven will probably be retired unless my kids or grandkids want to cook outdoors. Thanks! You’re so welcome, I’m glad this worked so well for you. Brandy really does add a special flavor to so many dishes, and the alcohol mostly burns off, so I agree, it’s a secret weapon for sure. I don’t have Cognac, but I do have brandy. Would it change the flavor or should I just opt out of adding it? Can I also just half this recipe for the 3 qt? I think that would work just fine Jin. Sue, I just love your blog! So many of your recipes have become family favorites, which is why this post makes me so sad. I bought an Instant Pot, tried it a couple of times and couldn’t quite get the hang of it (pork loin roast that was waaay overcooked, whole chicken that looked anemic). After my final attempt to figure it out, a mushy pot of Minestrone, I sold it on Letgo. Literally two days later, you started posting the most incredible looking recipes… made in an Instant Pot! Now I kick myself for giving it up every time I read one of your IP posts! I get that pressure cooking is faster and can produce amazing results, but is there a way that fools like me who don’t have one can still make this (and maybe other) IP recipes? I’m so sorry you gave yours away Tally, I really really love this machine and maybe you just had a couple of bad recipes to start with. 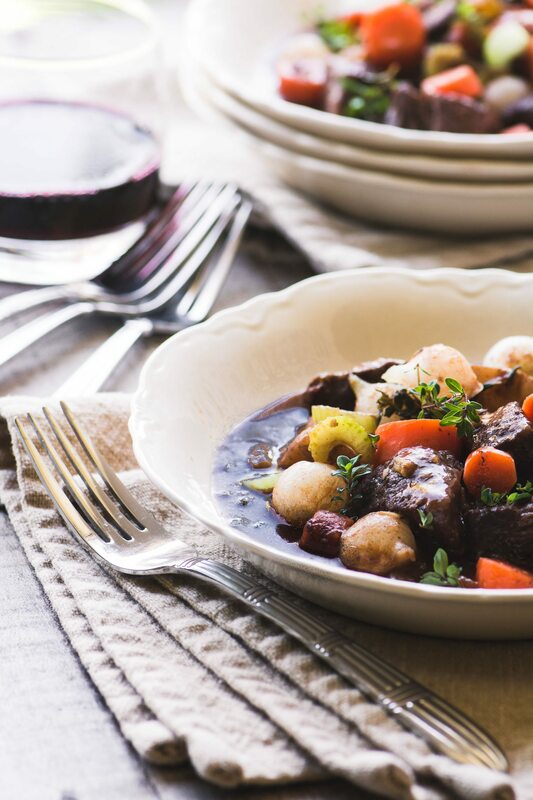 You can cook this bourguignon on the stove or in the slow cooker, I have recipes for both on the blog, just search ‘beef bourguignon’. That being said, I highly recommend you give the IP another try, I really think it’s here to stay and lots of bloggers etc will be coming up with great recipes for it. Sue – great recipe. I smashed it out of the park yesterday. I live in KC and we had a cold snowy Easter. This was perfect meal for that kind of day. It always tastier the next day or two, so I am excited for lunch today ha. My Dad makes this dish and it’s always been my favorite of his. It was a nice flashback of home! It looks so good and I am going to try it this weekend, but I don’t have cognac … does cognac necessary or I can use something else to replace? Thank you Sue! Cognac isn’t essential, so you can leave it out Cher. I just this evening purchased a very good Instant Pot, and am excited to “break it in!” Its purchase will allow me to divest myself of a rice cooker, a slow cooker and a stove-top pressure cooker! I have made, a number of times, what I consider the epitome of Beef Bourguignon, and that would be “Julia Child’s Beef Bourguignon” masterpiece! I am so excited to try this take on it, it sounds delicious, thank you so much for sharing your with us. I will report back my humble attempt! Thanks, can’t wait to hear what you think J.M.! It looks great ! I’m going to try it. Now I wish I had an Instant Pot . Your recipe looks so easy and delicious. Usually Beef Bourguignon takes a long time to make. You forgot to list the celery! I made a vegan version of this with some beef seitan I googled. It was nice. I’m not usually a fan of stews, but my family are, so they love it. Thanks Michael, I’ll fix that, and I’m fascinated by your vegan version! Sue can I do this in a basic slow cooker, my Nesco for instance or stove top? Don’t have an instant pot? Sorry if a dumb question. Tried your Instant Pot Beef Bourguignon, wonderful flavour and a delight to come home to after being out on the farm. Looked amazing many thanks for a great recipe. OOPS! Sorry, I accidentally replied to the comment below the one I meant to reply to. I made your Beef Bourguignon last night in my pressure cooker (I don’t have an Instant Pot version). It was delicious. I may have added a little too much cognac but that wasn’t a bad thing! Haha, it sounds wonderful, so glad you enjoyed it Linnea. Hello. What is gravy browning? A sauce like Kitchen Bouquet that adds a richer color to gravies in case you can’t or didn’t get it naturally from browning the meat. Instant Pot is on its way. I ordered it last night (through you) and it arrives tomorrow. Our guest Monday evening will get to taste the first meal cooked in it, Boeuf Bourguignon, French Bread and Crème Caramel! Thank you, Susan! P.S. Any cookbook suggestions for a beginner Instant Pot user? Do I need extra rings? Time to pull out the Instant Pot! Love Angus beef and this looks like the perfect cold weather comfort meal. But I don’t have an Instant Pot. Can I do this on the stove? The site continues to look beautiful. I visit every day. Keep up the great work! Thanks Guy, and yes, you can do this on the stove, and also in a slow cooker. I’ve got recipes for both on the blog, here, and here. This looks incredible! 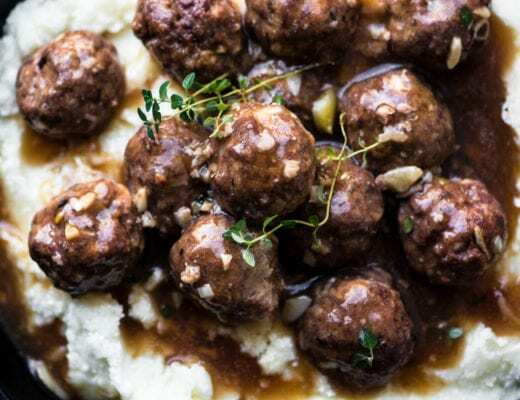 Instant Pot recipes are so amazing and this classic looks like it didn’t disappoint! ohhh man this looks amazing! I seriously need to go buy all the ingredients to make this right now! Actually I started paying attention to the beef labels after your nachos post, and I have to say, angus beef is pretty great, I’ll try this, thanks Sue! You make a very convincing case for the instant Pot! Eventually I will probably cave. 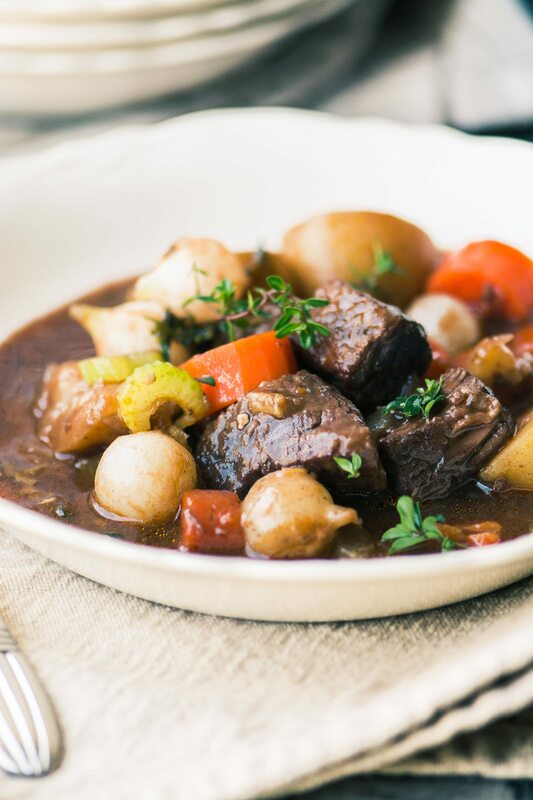 Boeuf bourguinon is a favorite, so pretty exciting to see I could have it in 30 minutes! 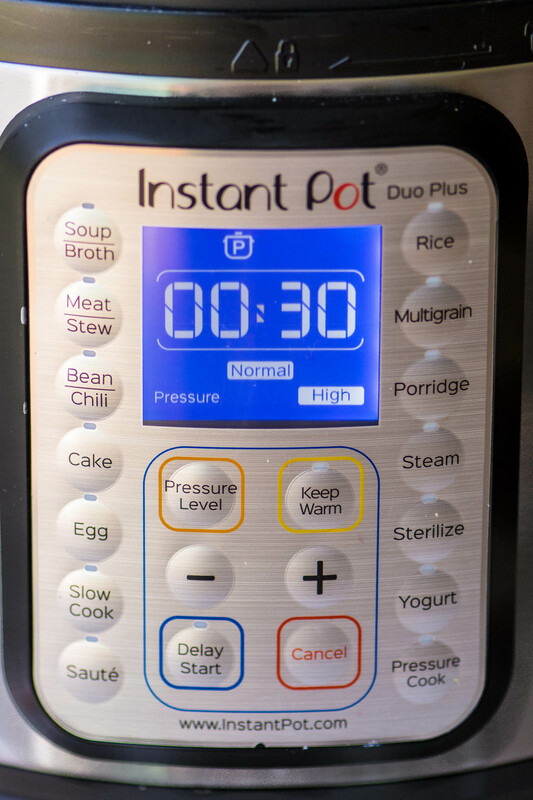 Sue, I am in love with my instant pot and this looks like it would be a HUGE hit with my family. My kids are major beef eaters. Can’t wait to try it! It looks wonderful. I’m so intrigued by this Instant Pot business! Seriously – this is the first recipe I’m going to make in my brand new “yet to be used” Instant Pot! It looks fantastic Sue! I’m still working on that start up guide for you Tricia! !